The Wicked Pickett along with The Exciting Wilson Pickett are the two albums that have the most songs that I had been familiar with prior to building up my Wilson Pickett collection. 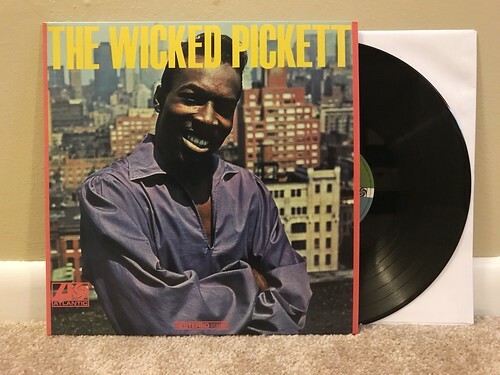 I had grabbed a Record Store Day version of The Exciting Wilson Pickett a few years ago, so I won't be writing up anything new about that album, but The Wicked Pickett is new to my collection and a welcome addition it is. This album is full of some of the best Wilson Pickett songs out there, "Mustang Sally" is the sort of hit that's just a part of the fabric of music at this point and there is no surprise as to why. It's a pretty damn perfect song. Then we have "Everybody Needs Somebody To Love." For me, this will always be a Blues Brothers song as I don't remember a time in my life where it wasn't a part of it. But the original Wilson Pickett version is every bit as good and exciting as the Blues Brothers rendition that's so special to me. There are other songs that I'm not as familiar with, including Pickett's versions of songs that had more notoriety from being performed by other bands. Most people are probably more familiar with the Gary US Bonds version of "New Orleans," but man the Wilson Pickett version is on fire. I can't believe I've never heard this before. He also does an incredible interpretation of the Eddie Floyd classic "Knock On Wood." Pretty much everything on this album is essential. It's kind of silly that took me as long as it did to get these records.